Over 400 runners raised at least $5,000 for the Poppy Fund today! On a snowy Saturday morning, runners braved slippery conditions, colder than average temperatures, high winds, and our semi-annual train stop. Their reward: a touching opening ceremony, pipers and drummers on course, beautiful Riverside Park, and hot food at the Legion hall. Huge thanks to all donors and fundraisers who have now collectively raised $60,000 in 10 years though this event. Thanks also go out to all the volunteers, including our groups from KWTFA and Invictus. 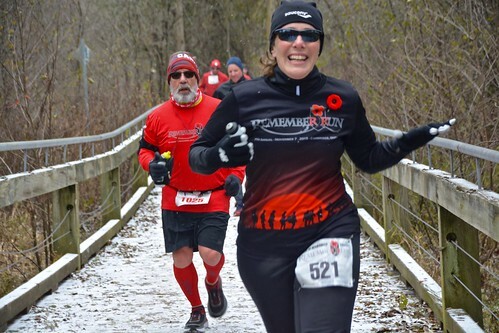 The official voice of RunWaterloo News. Thank you for putting on a fantastic race. I had a great time. The only disappointment I had was the bibs. In years past there was a space to write names of who we were running to remember. This year that space was no longer there. To me that was a disappointment. Hopefully that space returns for next year!!! Hi Phil, thanks for your support over the years. With this particular feature of the bibs, we found participants to be generally indifferent and the space was little used. We are interested in connecting the bibs to the cause in a more meaningful way if we can find one, but we don’t have a specific idea yet. I liked the changed course. Running east along the stretch by the 401 was great. Hopefully it stays. Great run…see you next year. We liked it too! We will definitely keep this in mind! Great race. Great cause as well. Great race! Riverside Park is really nice! The train only added to the experience! That is just a fun feature of this race. No way to avoid it so we just have to embrace it! I had a great time! Thanks for a great course and the bagpipes and drums were amazing!! Can I just add that the finish line video from this race has got to be the most exciting one yet?! Watching the 2nd, 3rd, 4th, 5th guys take off for the finish line after the train passed was great! I think the train adds to the excitement of this race. Now, with that being said, I have yet to be affected by it. Thank you for putting on another great race. The weather fit the day….a day of Remembrance! My 10 year old son’s first road race. He love it but now will expect a regimental band at all starts! Great race crew thank you!